FRANKly speaking, I’ve never been to such chic place to pick up my plastic! 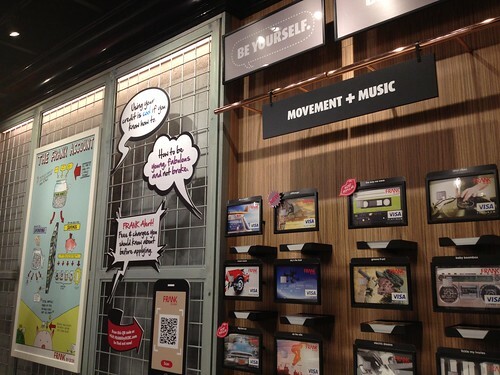 Thanks to OCBC, I had my first plastic shopping experience at their third FRANK store at Vivo City. The first thing that caught my eyes was the huge touch-screen at the entrance. It resembles one of those vending machine where you pick your favorite snacks from. 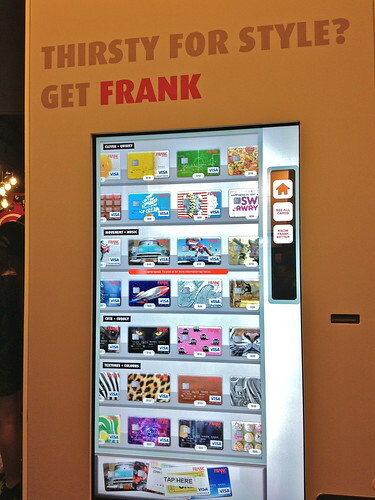 This lets you pick your design for your FRANK card! If you are not the touchy touchy kind of folks, get into the store and pick up some real cards then slowly decide which design to use for your FRANK card. Pick from over 130 designs with designs from cute and cuddly, quirky to wild and bold. I had a tough time picking mine that day! For FRANK Credit Card holders can choose to exchange their reward points for cash rebates or vouchers. They can also use the all-in-one VISA payment card to take a ride on trains and buses as well as withdraw cash and sign or tap for purchases. For those who would rather not spend too much “future” money can opt for the FRANK debit card which comes with a FRANK account. One key feature that attracted me to this FRANK account is the savings goals sub accounts where we can apportion our savings for different purposes. I’ve yet tried this out at this point since I only just received my FRANK card and pin. Will update again when I’ve time to explore this further. Oh and join them on Facebook too! Free ride with Uber to Echelon 2013! Previous Previous post: I want one! Lytro of course! Thanks for the post, Claudia!